Trengganu, Pahang, Selangor, Negri Sembilan, Johore. Endemic. Solitary or clustering rattan with stems to 20 m tall. 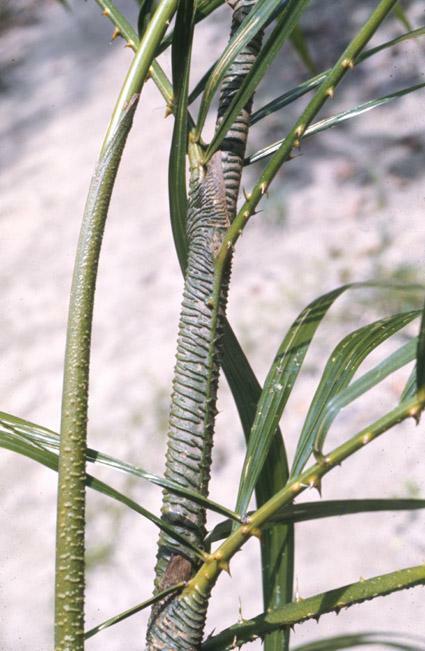 Stem without sheaths to 1 cm in diameter, with sheaths to 1.75 cm, with internodes to 20 cm long. All parts drying shiny dirty green to blackish. Sheaths dark green armed with horizontal rough ridges and rarefy with scattered dark green spines to 5 mm long and abundant buff-coloured indumentum between the spines. Knee conspicuous. Ocrea sometimes well developed, to 1 cm high. 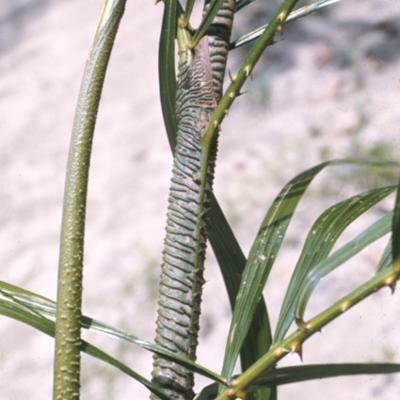 Flagellum to 1.5 m. Leaf ecirrate to 80 cm long, with no petiole or petiole to 15 cm long; leaflets generally broad and somewhat plicate, rather rarely narrow, 11-18 on each side the longest to 30 cm long by 4 cm wide, ± unarmed except for sparse bristles near the tip. Inflorescences male and female superficially similar, to 3 m long with up to 7 partial inflorescences to 30 cm long. Mature fruit not known. Good cane of 7-10 mm size class, but probably too local to be of much significance.